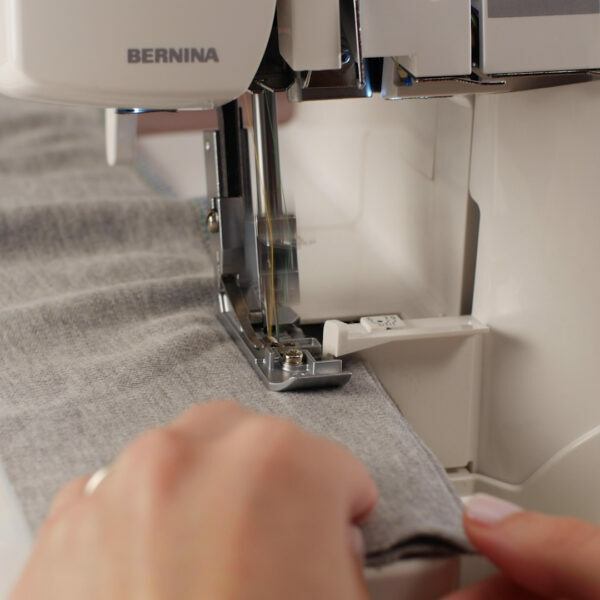 Have you ever been sewing with knits and completed your seam only to notice that edge is now longer than when you started? And perhaps it has a funny waviness that wasn’t there before . . . well, you are not alone. 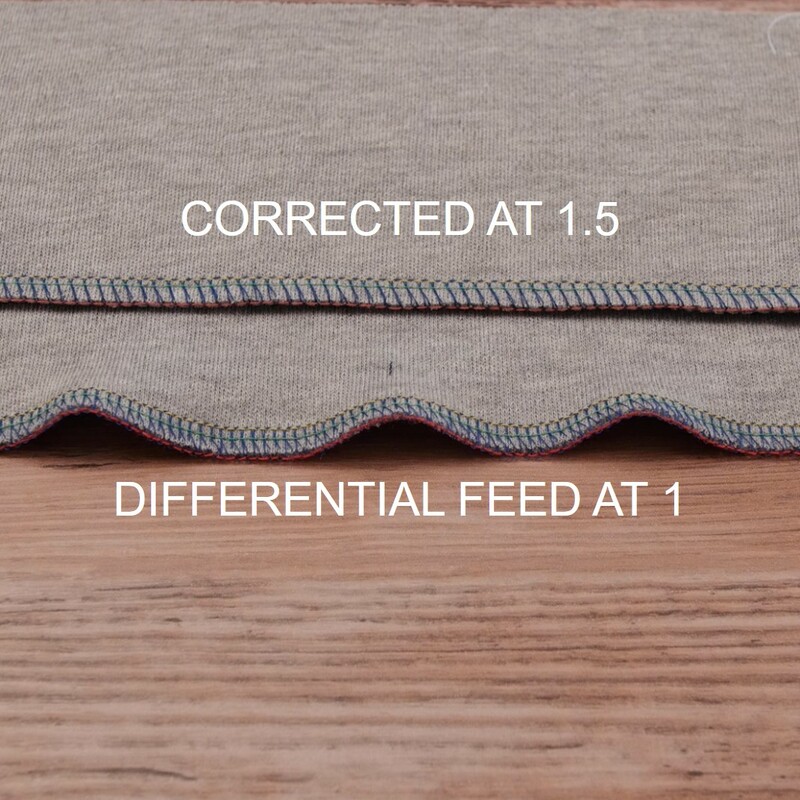 Most overlockers today have a feature called differential feed and this simple setting is there to help you perfect your seam finish. In addition to correcting a stretched out seam in knit fabrics, this functional setting can also be used to create gathers or scalloped lettuce edge finishes. 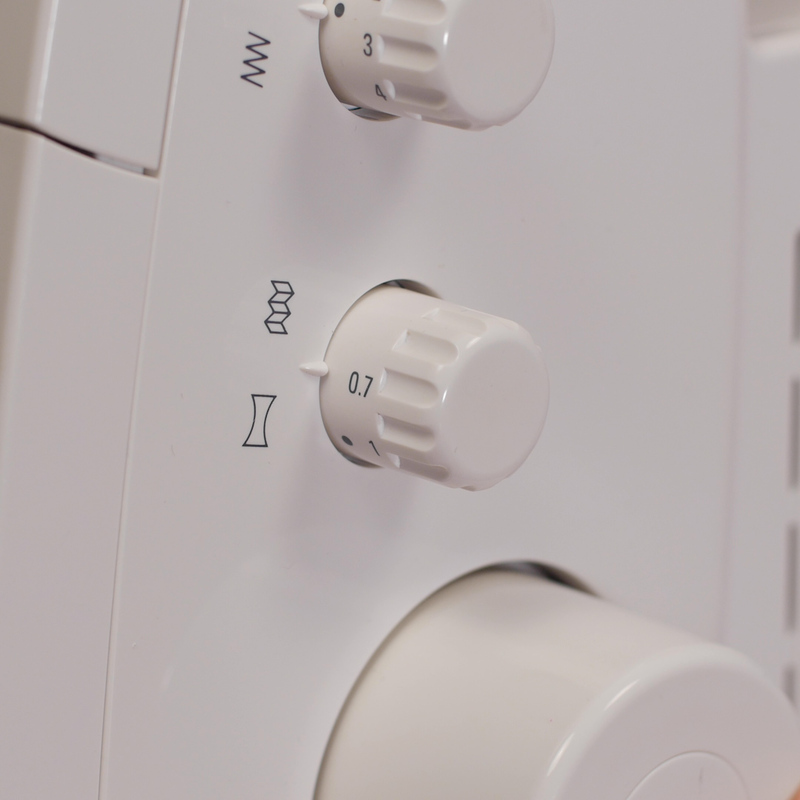 Once you understand the basics of how it works, it is easy to find ways to employ it when working on your next project. 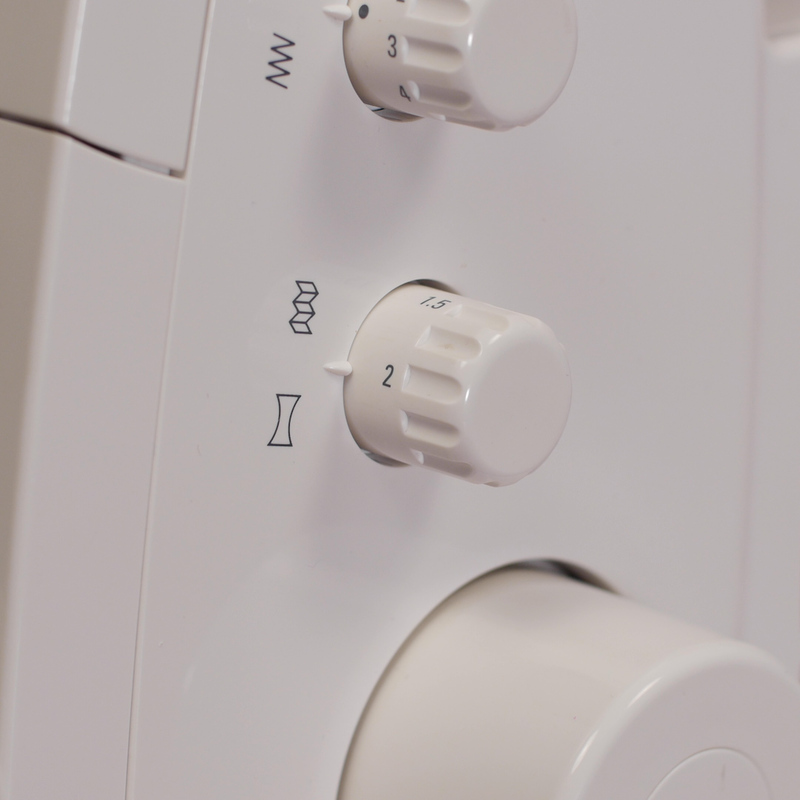 Overview: What is Differential Feed? This term is often confused with Dual Feed (a feature on some of the BERNINA sewing machines that allows for an upper feed dog to help move fabric evenly through the machine) or misused to mean presser foot pressure (the amount of pressure with which the presser foot meets the feed dog), but it is neither. When I first learned about overlockers, I found differential feed to be confusing and I didn’t know what exactly it was doing when I changed it. Of course experience is the best teacher, and after a few opportunities to use it in some projects, the concept became more clear to me. 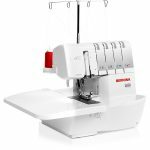 Like a sewing machine, the overlocker also uses a feed dog system to move fabric through the machine. However, unlike a sewing machine, the overlocker has TWO sets of feed dogs! And this, my friends, is the key to understanding differential feed. When you are adjusting the Differential Feed knob on your machine, you are in fact adjusting the rate at which the front feed dog moves. The back feed dog will always make the same rotation. There is a schematic drawing in the overlocker manual that illustrates this concept. The basic idea is that when you have the Differential Feed set to 2 the front feed dog will be rotating at about twice the distance as the back, thus moving much more fabric than the back feed dog. This is what eliminates the stretched out wave that is created when sewing most knit fabrics. On the contrary, when the Differential Feed knob is set to .7 the front feed dog is making a smaller rotation that the back feed dog. The back feed dog is now pulling more fabric than the front feed dog and therefore stretching the fabric as it is sewn. Of course when the knob is set to 1, both feed dogs are moving at the exact same rate. 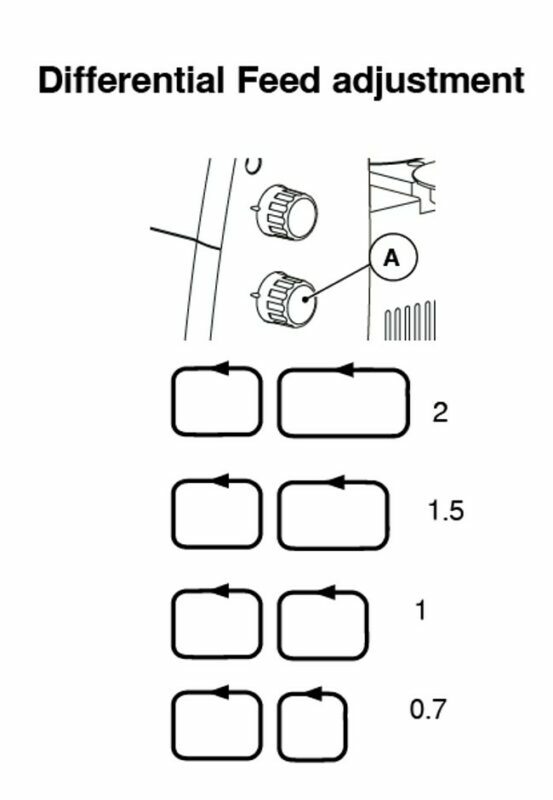 The other thing to note about Differential Feed is that it is variable and adjustable while sewing. 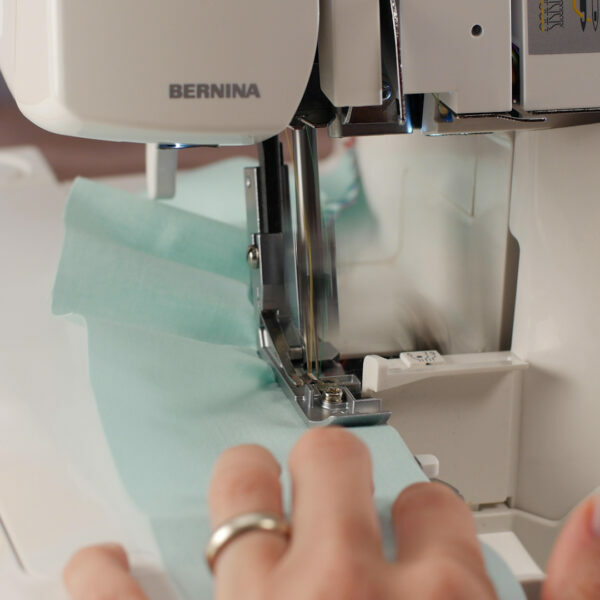 This means that you are not limited to the numbers/ratios shown as settings and most importantly that you can adjust this while you are sewing your project—hello bias edges and inset sleeves! So how do you know where to set it and why? Let’s explore some options in the samples below. Fabric selection is truly what determines where to set the Differential Feed setting more than any hard and fast rules. Generally, most woven fabrics will achieve a nice flat seam along a non-bias cut edge with the setting of 1, like this sample showing two layers of yellow denim. Often, although not always, knit fabrics will stretch as they are being sewn and create a wavy edge seam when the Differential Feed is set at 1. 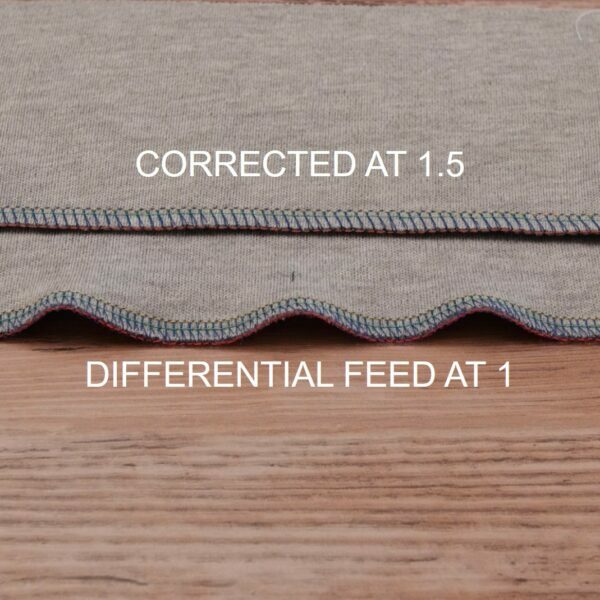 To correct this waviness, adjust the Differential Feed setting toward the 1.5 mark until the seam lays flat and even. See the difference this adjustment can make in a basic jersey knit shown here. My favorite way to use the Differential Feed setting of 2, is to create ruffles. In fact, I learned an easy way to remember this particular setting, gather “2”gether. I may or may not say it to myself each time I use this function. Because the front feed dog is pushing more fabric through than the back, at almost twice the rate, it easily gathers fabrics into a nice ruffle. 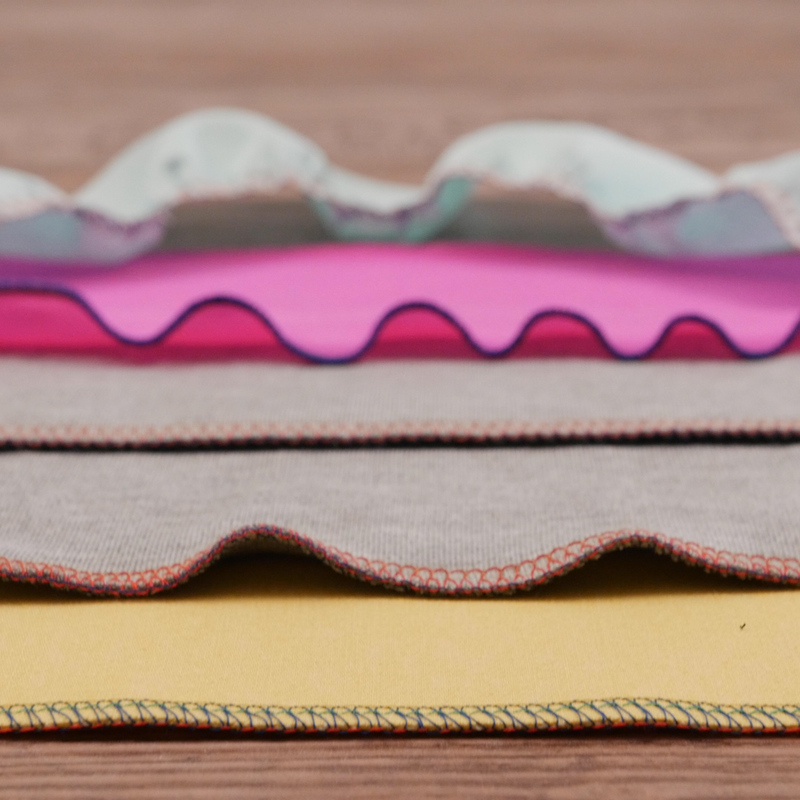 Combine this technique with a rolled hem edge finish, and you can create ruffles for pillows, bags and cute children’s clothing. 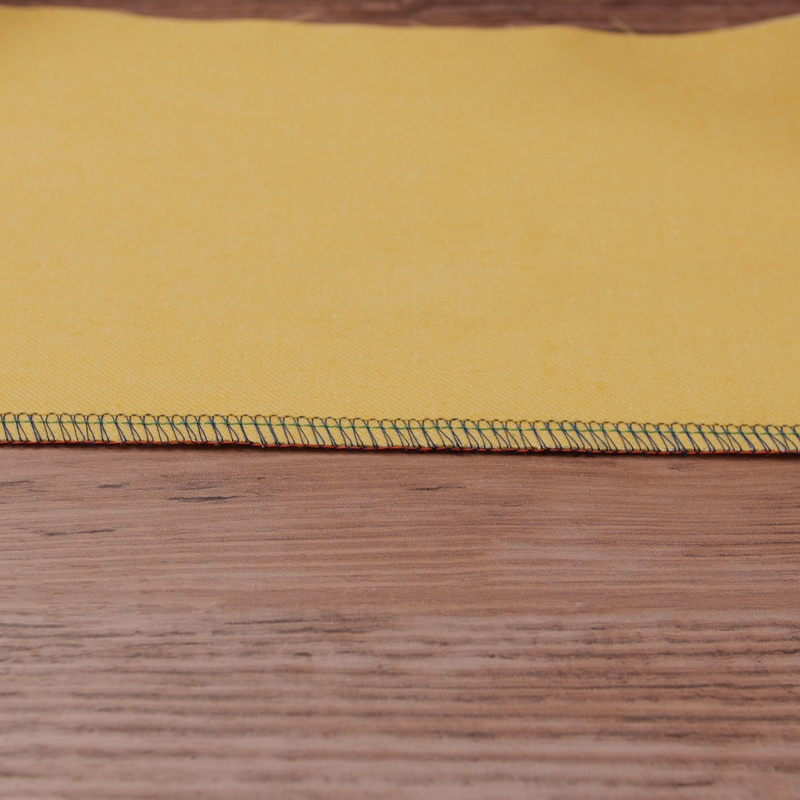 The rolled hem is a beautiful way to finish the edge of many fabrics. By adding in the Differential Feed adjustment at .7, you can create a scalloped lettuce edge. This setting can also be used to eliminate any unwanted puckering that could be happening with your fabrics. Tip: Using stretchy spandex knits will really enhance the lettuce edge effect. I hope that this has helped to define the uses for Differential Feed and to further explain how you might use it on future projects. The overlocker is a powerful tool that makes for expert finishes on every project. 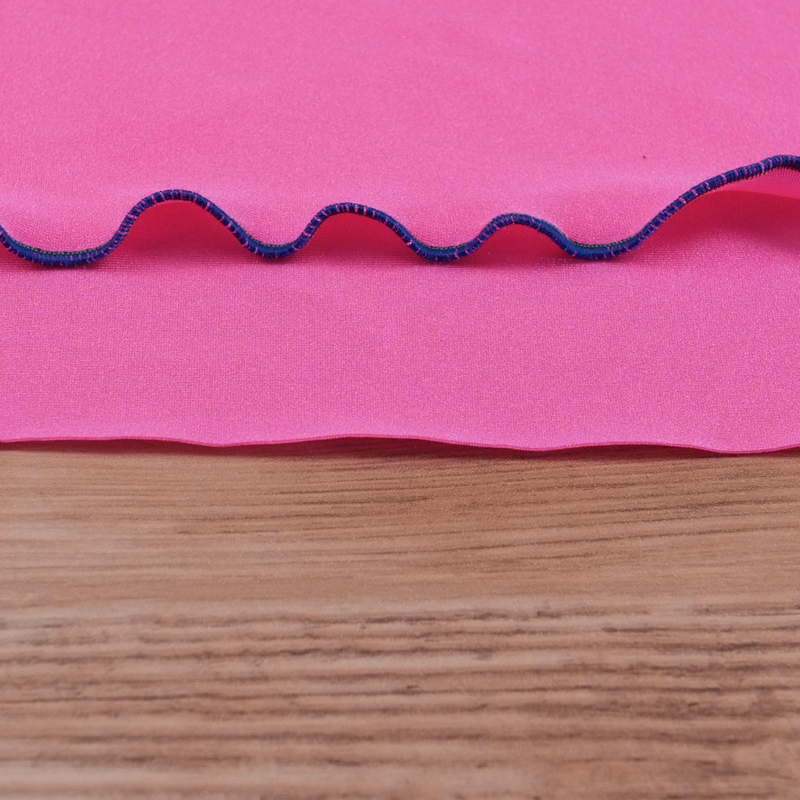 Happy serging!